Montreal police say they won't press charges against 24 year Eleanor Singh for carrying her miscarried foetus around in a plastic container. The police were alerted to Singh's peculiar baggage after receiving an anonymous tip from a concerned citizen. "We received a call that Ms. Singh was in possession of a dead child" says Sgt. Abernacle. "Our investigation revealed that she has been carrying around a fetus that she had miscarried while attending an outdoor rave in the fall. We convinced her to inter the child, and will not be pressing any charge. She's been through enough." Solar Plexus 4, the last edition of Sherbrooke's yearly psytrance extravaganza, was the party where the miscarriage occurred. "I was listening to Dj Threeyes spin some of the fiercest psychedelic beats I ever heard when a sharp pain coursed throughout my body," says Eleanor. "I looked down on the ground and there was blood everywhere and it was dripping down my legs, and my baby was in the dirt and he wasn't breathing and he looked so helpless and I didn't know what to do." After realizing that she had suffered from a spontaneous abortion, Eleanor decided she'd make the best of a bad situation. "Solar Plexus is a four day party, and I lost my baby on the first night. I couldn't just leave. He was dead, and it's not like I could bring him back to life. So I picked him up, put him in my purse, and I partied on in his honor." 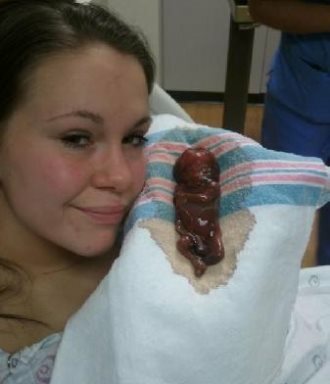 Once she started carrying her fetus around in her purse, she had trouble stopping. "At first, I put my baby in my purse because it was convenient, but eventually it just felt right having him there... I know what I did was wrong, and I'm happy the cops made me bury him, but people shouldn't judge me if they haven't been in my shoes. I'm the one who lost my baby. At first, I only carried my baby around inside my purse because I didn't want to leave Solar Plexus, but eventually, I started carrying him around because I didn't want to be separated from him. I'm not a bad person. I'm not."